Many times patients arrive at my chiropractic office with lower back pain that presented itself after lifting a heavy object. Using incorrect lifting techniques can cause injury resulting in sudden and severe pain. Without a doubt, this type of injury can almost always be prevented if proper lifting techniques had been used. Unless your line of work requires a lot of lifting such as nursing, warehouse work, retail stocking, etc. it is entirely possible that you have not had the opportunity to learn how to lift objects in a way that will protect your back. Hopefully, if you are in a line of work in which a lot of lifting is required, you have been trained on how to protect your back when lifting. For the rest of you, this article will explain the proper way to lift heavy objects to avoid injury. * Immediately before you lift and right after you are done lifting you want to stand upright and bend backward five or six times. This ensures that any distortion in the curve of your lower back is worked out. * Stand close to the object you are going to lift. Don’t have your feet together; use a wider stance for balance and support. * Bend at the knees, keeping your back straight, until you can comfortably get your hands under the object. * Keep the object as close to your body as you can so you are not extending your reach. Extending your reach will put pressure on your lower back even if you are bent at the knees. * Lean back slightly, this will help with your balance. Straighten up using the muscles in your legs to lift yourself up and using a smooth, steady motion. * If the object is very heavy, lift it to your knees and rest it there before straightening up. * To turn with the load in your arms, use your feet. In other words, do not twist your torso. Of special concern to me are those who have already developed recurring back problems. It is my practice to always advise these patients to seek help when lifting. I am well aware that this is not always possible. If this is the case for you, it is even more important that you develop a proper lifting technique. In addition to using a proper lifting technique, it is also important to work on your core muscles such as your abdominals and gluteals to develop a strong lower back. Consciously implementing this type of lifting technique and developing a strong core has the potential to make a pronounced difference in your life particularly if you suffer from chronic lower back pain. Chiropractors are doctors who can diagnose and treat a wide variety of condition, specifically those that include symptoms of neck and back pain, restricted movement in the joints and muscular problems. Their treatments include massage, manipulation and spinal decompression, amongst others. To help you understand what a chiropractor does, first let us take a look at how we are made. 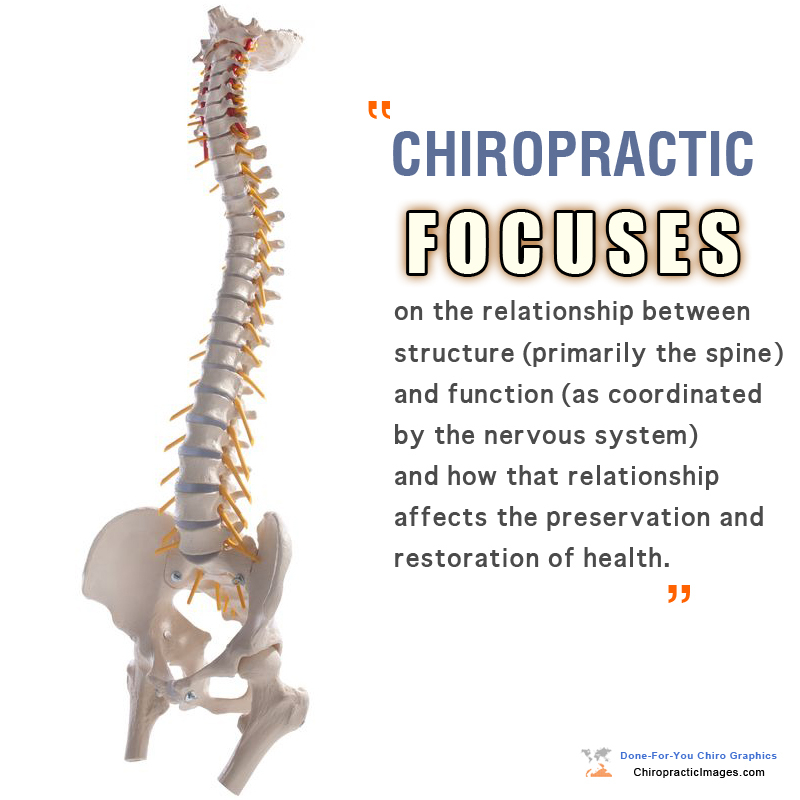 The spine is the focal point of most, if not all chiropractic treatment. It is formed out of 33 separate bones, in a single column. Between each of the bones is a cushion made up of a gel like substance; this helps with flexibility and mobility. Unfortunately, as we age, this gel gradually hardens, reducing flexibility and increasing the likelihood of pain. One of the chiropractor’s jobs is to keep these bones in a straight line with each other, known as alignment. In order to qualify as a Doctor of Chiropractic, each one has to go through a very extensive program of training and education. At the very least they need a 2-year undergraduate degree in one of the sciences. Some States require a 4-year degree. Once this degree has been successfully obtained the chiropractor must then undergo a 4 year program at an accredited school of chiropractic medicine. On receiving that degree they must then pass an exam through the National Board of Chiropractic before a licence to practice can be awarded. It shuld be obvious to anyone that a Chiropractor is highly trained and is a proper doctor. In fact to a certain degree they are more highly trained and educated than your GP is. There are no age restrictions when it comes to treating problems with the back and spine. A chiropractor can treat anyone, form young babies right up to senior citizens. Many people probably do not realise that a chiropractor can prevent attacks of colic and can help to ensure that children and babies grow up without problems. For the elderly, although they cannot reverse the aging process on the spine and its gel cushion they can realign the spine and make their lives as pain free as possible. Chiropractors do not use any form of surgery or medication in their treatments. They will not even use painkilling injections, preferring to work only with their hands performing a complete natural method of healing. A chiropractor can also help you with nutrition and diet advice as well as teaching you toe exercise properly and safely. When all is said and done a visit to a chiropractor could be the best decision you ever make for your health and well-being. and it is an important one. Roughly one out of every three men and two out of every five women born in the year 2000 will suffer from diabetes in their lifetime. The average person may not recognize how diabetes and chiropractic are connected. What does the back have to do with blood sugar? Often, an electrician understands this faster than most people. Interfere with the current flowing through the wires and the appliances or areas of the house lose normal function or might even catch fire. If the nerve supply from the upper neck or middle back (the two areas that supply the pancreas) are disturbed, pancreatic function suffers; maybe in it’s ability to produce enzymes to digest proteins, fats and carbohydrates, or maybe insulin production, or both. Blood sugar and digestion become unbalanced, resulting in either in diabetes or hypoglycemia. The National Post reported: “DIABETES BREAKTHROUGH: In a discovery that has stunned even those behind it, scientists at a Toronto hospital say they have proof the body’s nervous system helps trigger diabetes, opening the door to a potential near-cure of the disease that affects millions of Canadians. Diabetic mice became healthy virtually overnight after researchers injected a substance to counteract the effect of malfunctioning pain neurons in the pancreas. ‘I couldn’t believe it,’ said Dr. Michael Salter, a pain expert at the Hospital for Sick Children. ‘Mice with diabetes suddenly didn’t have diabetes any more.’ The excitement of the team from Sick Kids, whose work is being published today in the journal Cell, is almost palpable. Article contributed by Murray Galbraith, D.C., of Galbraith Chiropractic. Investigators analyzed one billion anonymous status updates among 100 million Facebook users and found that feelings can be highly contagious. Lead researcher Dr. James Fowler explains, “Online networks can spread emotions just like the real world.” His team found that for every happy post a person makes, it causes friends to write an additional one or two happy posts; likewise, every negative post spawns another negative post.